This is my nekkid block ready for a quick iron and then i'll send it off on its journey. I don't usually "do" black so this will be an interesting challenge! It should pop the colors folks use!! Can't wait! 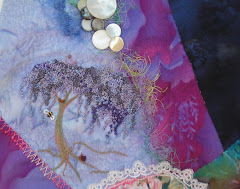 This is my final block in the beaded rr. I was sort of ALL over this block to help fill it up so if you go to my flickr account you'll find all the pics there. This rr has been a lot of fun! I hope that everyone enjoys the work i've done for them as much as i've enjoyed doing it! 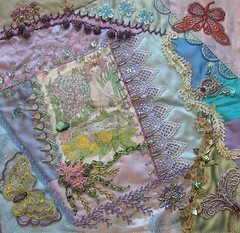 I did three butterflies, the snail, the feather stitched seam, the viney seam with leaves & flowers, the lace flower motifs (single & 3) at the top and the fairy! PHEW!!! LOL!! Now to catch up on some other blocks!! This is the pic of my mom and dad posing in their wedding attire. I got the pic into my system, printed it on fabric, then made a pillow out of it. Of COURSE, I don't have a pic of that yet, but will the next time I get back to Denver. 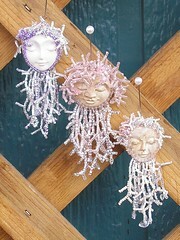 Envision roses, SRE, trailing ribbon and beads. This was a year for many hand made or hand embellished gifties. 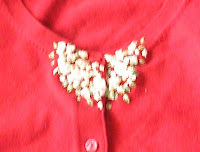 This is a sweater for my Mom that I did some SRE on. She was enamoured with it so I guess it was a good gift! LOL!! I also created a little face brooch for her! She was so funny! She said she had been afraid that i'd forget her! Silly girl! LOL!! 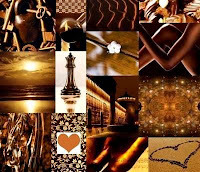 Brown Your soul is painted the color brown, which embodies the characteristics of calmness, depth, nature, stability, tradition, poverty, roughness, down-to-earth, uncertainty, and neutrality. Brown is the color of the element Earth, and represents soil and, to a lesser degree, fertility of the Earth. This is my Peppermint princess! 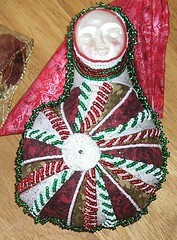 Judy sent her with one of her Christmas cards that acted as her inspiration for this doll! It looks EXACTLY like it, Judy! Perfect!!! There is ALLLLLL beading on her and I LOVE her face....so peaceful and lovely with the little blush to her innocent cheeks! I will treasure her always, Judy! Thank you, thank you! the love and golden shine of the season!!! We have opened our gifties now.... next I will show you the treasure that Judy made for me! VBG! Look at this!!! 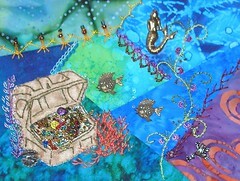 A mermaid and treasure and great little fishy charms!!! What more could a girl want??? 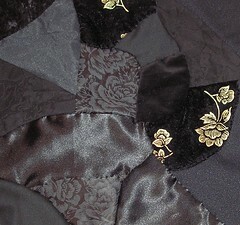 This quiltlet is AWESOME!!! Thank you SOOO much Diane!!! The kids will DEFINATELY enjoy all this eye candy! Last face for now is from my forest type faces family! I have been playing with trying to re-create the look of wood with fimo. Some are dark and some light as this is. 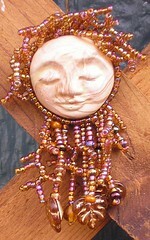 She has a sweet smile and is dreaming of faraway trees and spaces filled with song! She too is for sale; finished with ultra suede and a brooch/pendant pin back! Enjoy!! 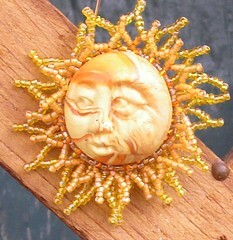 This is a second pin with a different approach....rather like the sun! This is one of my favorites with his bright smile and rays or warmth! Also for sale, finished with an ultrasuede stitch on with peyote stitch and the brooch/pendant pin back! This has a been a realllllly beady couple of months! Lots of learning, playing and....some bead skating also! LOL!! (rolling around on spilled beads in my world) VBG!! Soooo, this is the first of three pins that is for sale. I have started an Etsy shopped. We'll see how that goes! 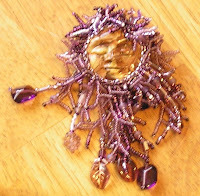 It is finished the same as my other pins, with a peyote stitch over the ultrasued and the brooch/pendant pin. Makes this more versatile I believe! On to the next one! OH! The shop name is Golden Willow Creations! Tada!!!! They are DONE!!! 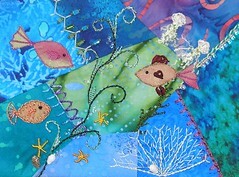 This was a special order from a couple of wonderful ladies at my crazy quilting group!!! The requested specific colors...so here they are! All of are finished with a brooch/pendant back so they can be worn either way! I'm so happy i'm gonna go work on something for ME now!!! Cqey that is! VBG!